Although generally considered inferior to both the MiG-17 it succeeded and the MiG-21 it preceeded, the MiG-19 became yet another successful jet fighter to emerge from the Mikoyan Gurevich design bureau. The first model to enter service, the MiG-19P, was the first Soviet combat aircraft capable of maintaining supersonic speed in level flight, but was soon withdrawn due to high accident rates and disappointing engine reliability. The improved MiG-19S addressed these problems with a redesigned elevator and tail assembly to eliminate stability problems at transonic speeds as well as more powerful engines. Later models introduced radar for all-weather capability and the ability to carry air-to-air missiles. However, production of the MiG-19 within the Soviet Union was rather short-lived and ceased by the late 1950s in favor of the much more advanced MiG-21. This decal sheet offers the modeller 6 decal options. 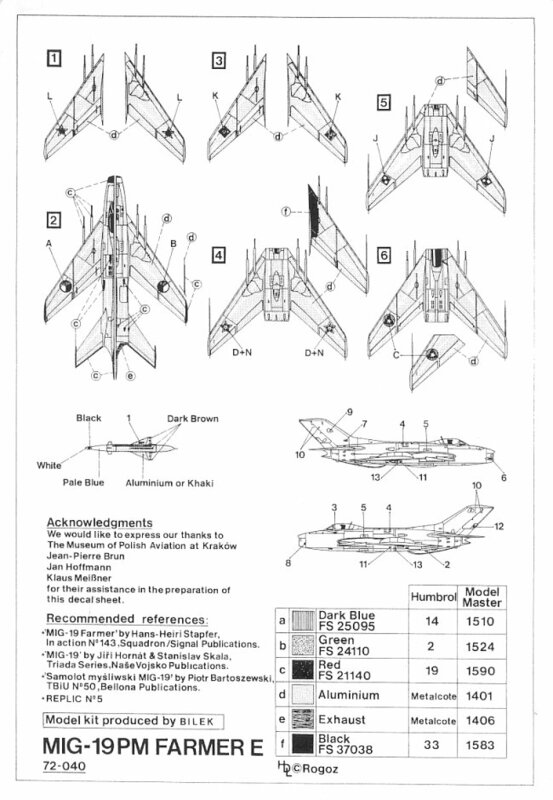 There are enough stencils included to do one of the 6 planes featured on this sheet, although with additional stencils all four planes could be made. 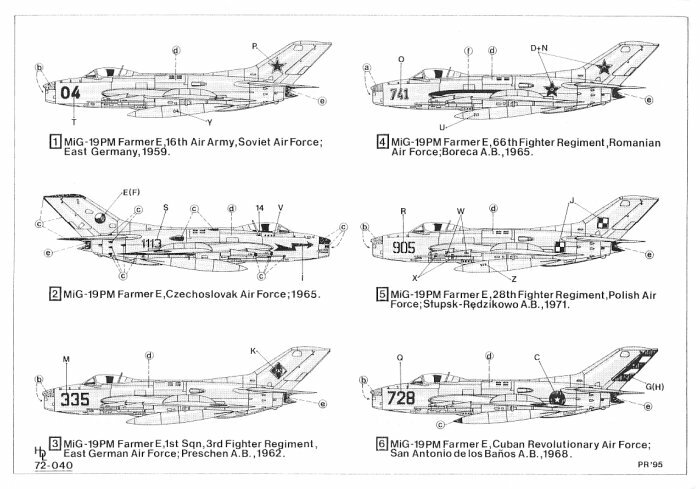 The first decal option is for an MiG-19 Farmer E of the 16th Air Army of the Soviet Air Force in East Germany in 1959. This plane is painted Aluminium with a bit of Green (FS 24110) on the topside of the intake. 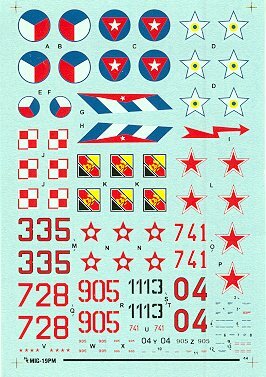 The second decal options is for an MiG-19 Farmer E of the Czechoslovak Air Force in 1965. This plane is painted Aluminium with a bit of Red (FS 21140) on the topside of the intake as well as a bit of red in tiny areas on the airframe. This plane also has a red lightening bolt type arrow on the right side of the nose. The third decal option is for an MiG-19 Farmer E of the 1st Squadron of the 3rd Fighter Regiment of the East German Air force at Preschen AB in 1962. This plane is painted Aluminium with a bit of Green (FS 24110) on the topside of the intake.  The fourth decal option is for an MiG-19 Farmer E of the 1st Squadron of the 66th Fighter Regiment of the Romanian Air force at Boreca AB in 1965. This plane is painted Aluminium with a bit of Dark Blue (FS 25095) on the topside of the intake. The fifth decal option is for an MiG-19 Farmer E of the 28th Fighter Regiment of the Polish Air Force out of Stupsk--Redzikowo AB in 1971. This plane is painted Aluminium with a bit of Green (FS 24110) on the topside of the intake. The sixth decal option is for an MiG-19 Farmer E of the Cuban Revolutionary Air Force out of SanAntonio de los Banos AB in 1968. This plane is painted Aluminium with a bit of Green (FS 24110) on the topside of the intake. This plane has Red White and Blue decals for the flight control surfaces of the vertical stabilizer. These decals are clearly printed in register and appear very thin, so they should conform beautifully. The small stencil writing is clear, but too small to read on the 1/72 sample I have before me.